Discovery 1: Stalin a man of rust or a man of steel? Recall the last lesson: What are my thoughts? Economic Factor: Was the economy stable under Weimar government? In this section we are looking at the economic impact of Stalin's policies on Soviet Union. In this section, we will be evaluating the economic policies that Stalin has imposed on Soviet Union. 2. To demonstrate the superiority of communism over capitalism (Western powers) by proving that a modern USSR could out produce the leading capitalist nations. 3. 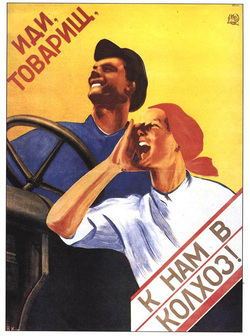 To improve the living standards of all Soviet citizens. In order to feed the population, Stalin required the soviet agricultural sector of the economy to be more efficient. He hoped to achieve this through the introduction of new methods of production especially through the increased use of machinery, mainly tractors. By 1928, the USSR was 20 million tons of grain short to feed the towns. Industrialisation was creating even more towns, increasing this problem. So in order to feed his industrial workforce Stalin needed to revolutionise agriculture. Raise revenue to fund industrial revolution. The best way of doing this was by exporting grain abroad. Maximize the production of grain by revolutionizing the METHODS of agriculture. Traditional Russian farming techniques were poor. Small plots of land meant that innovations such as fertilizer and tractors could not be used. Many peasants were still using horse drawn ploughs. Control the production. Since the NEP ,the Kulaks (wealthier peasants) had controlled prices of grain, and had hoarded their surplus to ensure that prices stayed high (because high demand and low supply = high prices!). Stalin needed to ensure that the price of grain was cheap, so workers in the town could afford to buy grain without Stalin having to increase wages. So he needed to destroy the power of the Kulaks to control grain prices. Stalin may also have wanted to destroy the Kulaks for ideological reasons – having a class of ‘agricultural capitalists’ didn’t really fit with Communist ideas! Kulaks resisted the policy; when the Red guards came to seize their grains and sent them to labour camps; many burned their crops and killed their animals. Anyone who objected was sent to labour camps in Siberia. Millions of peasants were forced off the land into industry in the cities. Despite such shortages, Stalin continued to force collectivization. He also continued to seize grain; resulting in a rise in grain collection from 10.8 million tons in 1928-9 to 22.8 million tons in 1931-2. This obviously improved standards of living in the towns. Stalin also continued to sell grain abroad. Even in the worst years of the famine like in 1932, the country exported 1.73 million tons and only slightly less in the next year. By 1934 there were no Kulaks left. By 1941 almost all agricultural land was organized into collectives. The system of differentiation was introduced whereby people with special skills were given rewards and benefits in form of housing. Literacy schemes were introduced and publicized through propaganda. Stalin aimed to modernise USSR through a series of Five-year plans. New dams and hydro-electric plants were built to create the energy needed for the new industries – e.g Belomor Canal, on which 100,000 workers died. Extraordinary targets set for workers. Targets were set for every industry, each region, each mine and factory, each foreman and even every worker! This was thought necessary because most industrial workers were former peasants, who were used to working at their own speed. Failure to meet targets resulted in an increase in the target and/or a wage cut! From 1932 workers had to have official permission to change jobs or move area. This probably suggests that some workers were getting restless about the unachievable targets and trying to leave their jobs. Although the plan was scheduled to last 5 years, propaganda urged workers to complete targets in 4! Stakhanovism campaign. Alexei Stakhanov was a minor who organized his team to cut 102 tons of coal in a shift – his target was 7 tons! (1934). He was used as propaganda. Workers who exceeded targets received a medal, or higher wages - Stakhanov workers could earn 1,500 to 2,000 rubles or more a month, as compared with the average monthly wage of 250 roubles. But by 1934, the government stopped promoting Stakhanovism, which suggests they knew such propaganda was ineffective. By 1938 had overtaken Britain and Germany in industrial output. Towns created out of nothing such as Magnitogorsk in the Urals, which grew to 250,000 people. Such rapid growth of towns created shortages – so rationing was introduced. Housing was also poor. Many families lived in 2 rooms. Petty crimes and hooliganism were fairly common in these cities. In 1932 Stalin announced the plan had achieved its targets a year early and the 2nd plan was announced! It continued to develop heavy industry but branched out into new areas. The shortage of workers was addressed by encouraging women into work. By 1937 40% of the industrial workforce was women, compared to 28% in 1927. As a result, there was greater equality between men and women in Russia than other countries, and this was reinforced through propaganda, showing men and women as equal partners in the socialist struggle. But no women ever held high-office in Stalin’s government, and the state did encourage marriage and motherhood. Development of new industries was somewhat undermined by the purge of capitalists that had taken place since 1919 and the purge intellectuals that Stalin carried out in the 1930s (you have another information sheet on this). Foreign experts and engineers had to be recruited. There was also a return to inequality in society; to improve production, managers, scientists and party bosses were given much higher standards of living as incentives – they earned more bonuses and had perks such as holidays in state-run resorts. Planned to produce more consumer goods, such as radios and bicycles, to raise the quality of life of Russian people. There was also a plan to improve the quality, rather than just the quantity, of goods produced. In reality much industry was directed towards defence. Nevertheless, there were economic improvements: Rationing came to an end and free education and medicine were made available to more and more of the population. Any economic growth was interrupted in June 1941 when the German army invaded Russia. The Russians managed to resist the German invasion single-handedly until June 1944 D-Day landings.